The chart below shows the number lines of code used to build a variety of current and historic technologies. Combining all Internet services Google uses about 33 times as many lines of code as Facebook as indicated by the delta bridge. 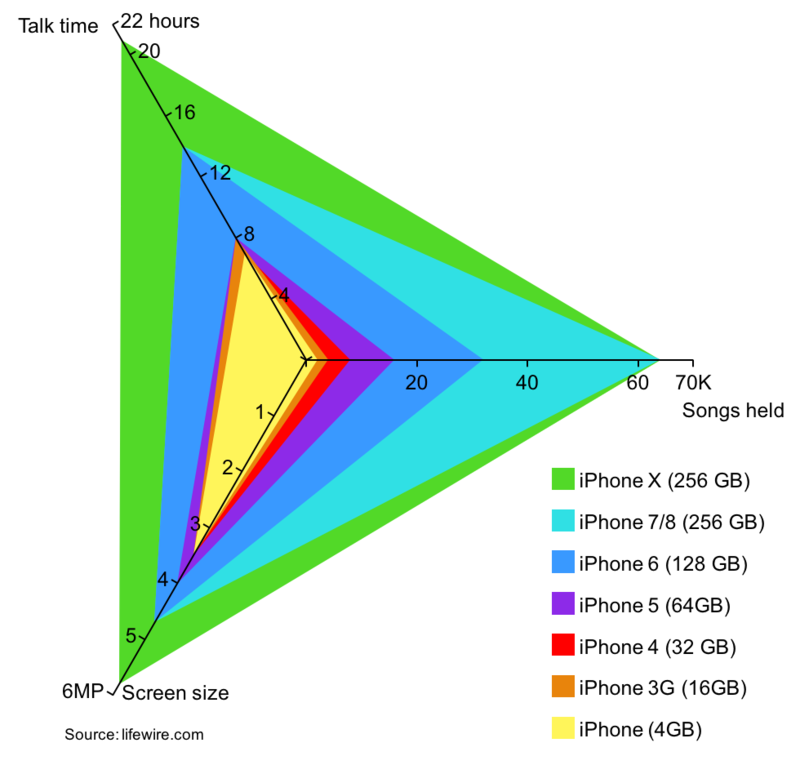 Given this large delta we use an axis break to help show Google on the same chart as the other technologies. This chart was built using the Aploris add-in on a Mac with PowerPoint 2016 (64-bit). Aploris offers an improved and efficient way to create charts in PowerPoint. With Aploris you can build spider, Gantt, and Mekko charts in addition to the typical business charts. This entry was posted in Bar chart and tagged Technology by Aploris. The Mekko or Marimekko chart below explains the purpose and operating country for all the man-made satellites orbiting earth. Columns are organized by operating country and the width is proportional to the number of satellites. Rows are organized by purpose and the height is proportional to the share of the purpose. As such, the segment areas represent the number of satellites operated by a specific country for a specific purpose. The US operates the majority of satellites (largest width) and globally the most common purpose is communications (largest heights). This Marimekko chart was built using a Mac and Office 2016 with the Aploris add-in. This entry was posted in Marimekko and tagged Global, Technology by Aploris.